Mrs. Godowsky’s eldest child is a son and he is at home sick. He comes to me requesting, “Mako, come and play with me.” In spite of asking me to stick to him during his games, he speaks hatefully of people, as if he doesn’t consider them humans. 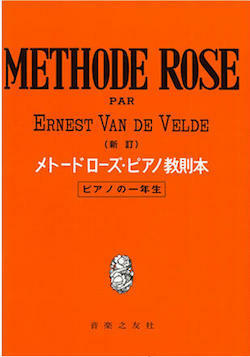 In the piano manual Method Rose, there is an old French song “Au Clair de la Lune”. When I start singing in French I’ve learned, instead of screaming “No! No! That’s wrong!” they burst into laughter. When I played the “Toys Dance the Cha Cha Cha” for Rosemary I added an exaggerated glissando to it, and she liked that very much. After that, she would grab the first thing saying, “Let’s play the Toys Dance the Cha Cha Cha!” and twang plump glissando with her chubby fingers. I taught Mrs. Godowski to play “Sakura” (Cherry Blossom). She said the soft Japanese language was beautiful. Lisa was completely smitten by a cousin of hers called “Natalie”. “You are also beautiful,” I encourage her. Mrs. Godowsky’s oldest son studies the piano at the Toronto Royal Conservatory of Music. The name of his professor is Tchaikovsky. Since the student’s concert is taking place at the Road Avenue affiliate to the conservatory, I got to go and attend it. Lisa came trotting down to my room in the basement. “I can’t wear that because those are summer clothes.” So I point at a red dress. “That's OK,” she approves and leaves my room. She’s such a girl. There was a huge amount of clothes and toys in the house. There was also a record with contemporary French songs for children. I especially liked “Natalie” and “Telephone Song” from this record. I think “Natalie” is a song about love for a small girl like the one called “Sacchan” in Japan. The name “Natalie” is repeated after some text that comes before it. In “Telephone Song” I knew in French just the part that went “Telephone rings with a ring a ding, ding. Hello girl, missus, mister.” A bell would ring in this lively tune, and we could have a “Here I come!” feeling of adventure. I guess they had this French record because Mrs. Godowsky’s husband was a French Jew from Algeria. Maybe some French songs are especially beautiful because of the language＆lyrics. I fell completely in love with these two songs and listened to them a lot because they gave me comfort. I would get tired when playing with kids, and I often wanted to lie down and rest. When it was all three of them, I would put them in bed together and pretend to be a wolf. Then starts the chuckling. Over the blanket I choose one little body, and then go squeezing each in turn. When I strip off the blanket in the end, the children can’t help laughing in abandon. During garden parties I would chase Frederic Phillip around. He was a good playmate because whenever our eyes would meet he would join me in playing tag. Although their parents treated me atrociously, when children would play with me in such endearing way I felt like being in a Mozart’s opera. Thanks to the children, even in this cruel house I was able to have fun sometimes. How come children find joy in the smallest things? Surely it is because they don’t immediately think, “How much money does my playmate have?” They probably don’t spread themselves in all directions because they live and think in now and here.